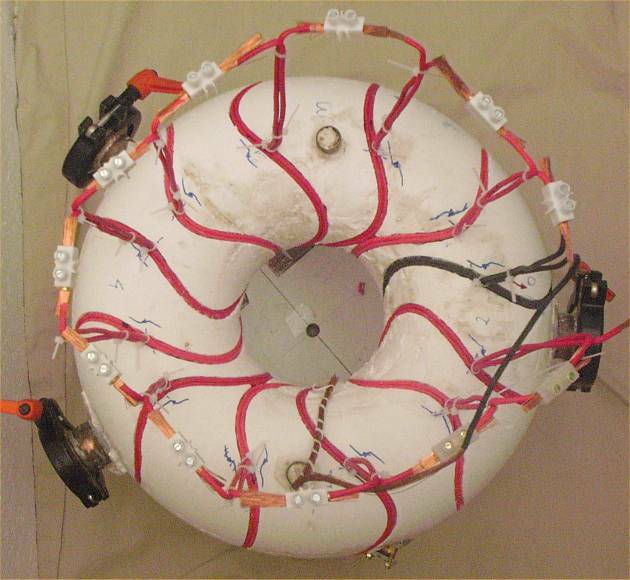 Abstract : Details about the assembling of the definitive modular coils for UST_1 are reported. The materials, tools, time of operations and difficulties are briefly described. Some of the challenges are the tricky access and vision of the internal part of the grooves, the tendency to unwind and the non-perfect circularity of the conductors. In July 2006 the coils are finally wound. The result can be seen in Photo 1. The winding of the non planar coils is very challenging because the conductor cannot be pulled to be adjust in the groove and sometimes the conductor is loosen when pulling (depending on the position of the conductor with respect the curvature of the groove). 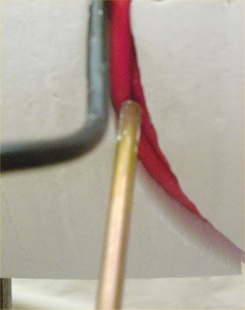 The compression against the walls of the groove is one solution to maintain the conductor in the correct position while winding. Additionally the vision of the internal part of the groove is sometimes not easy. 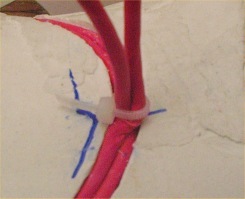 Initially a 45º bend is produced to obtain a crossover as can be seen in Photo 2.
a) First the auxiliary (in black in Photo 2 and 3) and the real conductor (in red) are wound simultaneously one turn. other segment of the conductor is located and compressed in the space, forming the second part of the pancake. The process is shown in Photo 4. The groove was designed and machined to achieve some level of compression, otherwise this particular winding would have been impossible. Two specific tools are used to press the conductors. The process is repeated 6 times per coil and lasts about 45min per coil. Adding 15 minutes to cut, adjust and connect the coils the average is 1h hour per coil. More time will increase the precision in some degree. * Two suppliers of heatshrink tube are used due to holidays at one supplier. However one of the tubes happend to be more adequate than the other. The worst tube tend to poorly compress the filaments of the conductor and tend to adquire non-circular more irregular cross section which difficults the winding. The errors using this tube are about 50% higher than the best one. * Each winding is a double pancake. The external crossover compensates only partially the internal crossover but it could be improved. The best solution by now is shown in Photo 6. 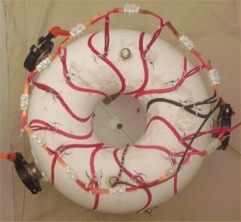 Additionally the successive coils are wound in a symmetrical manner but only 12 coils compose the stellarator and 4 pairs of coils have the upper terminals at long distance so compensation is poor. Some improvements might be tested if magnetic surfaces appear. The use of more turns would be the best solution but the voltage and power supplies become far more complex (impossible 12V batteries). Pairs of pancakes would be perfect but twice as grooves are necessary following the present philosophy. * The vision of the groove and conductor is sometimes impossible. Occasionally a mirror is used to help. The lower part of the torus and the first layer corresponding to the bottom of the groove are especially adverse. The torus is on the columns of the mechanising device but this legs are too short for the present function. * The precision of the winding is lower than the precision of the grooves because the conductors tend to uncompress. Compressing beams might be used to maintain the external turns correctly fixed under any circumstance. However the supports or threads to fix these bemas are not prepared. The present prescision, without external pressure beams, is about +-0.3mm. Photo 1 . Top view of UST_1. 12 definitive modular coils formed by 6 turns in a precision groove. The winding is made by a double pancake, 6x2 turns. Photo 2 . Internal crossover. Pressure thread to maintain the coil in position while winding (in black). The internal crossover is compensated by a symetrical external crossover. Photo 3 . 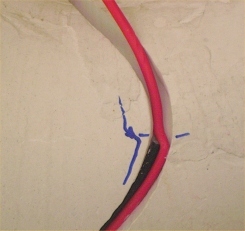 Both cables (real and auxiliary) are compressed in the bottom of the groove and against the lateral walls. Photo 4 . 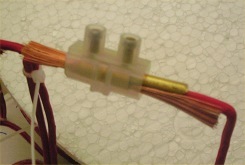 The other part of the conductor is located in the space left by the auxiliary coil. The thin tool is usually used. Photo 5 . 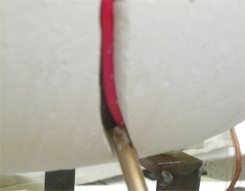 Splice of conductors mutually compressed by means of a special brass rod. Photo 6 . External crossover. The compensation is not perfect becasue it is 6mm over the internal crossover and because the bends are complex to accurately mechanise and locate.